The first thing to discuss in this Porter cable CMB15 review is the max tank pressure. The number for this model is 150 psi. It stores air in the tank to achieve longer tool run times. The air pressure that a unit produces in the tank is measured in Pounds Per Square Inch. Small models will normally only hold 90 psi. This makes it capable to run simple air tools. A powerful compressor will run 150 psi or more. This means that this Porter Cable air compressor will be able to work a vast amount of tools. This Porter Cable air compressor has one piston that is used to compress and deliver air to the tank. This Porter Cable CMB15 review must mention that the unit provides 2.0 SCRM@90 psi and 3.0 SCRM@40 psi. In order to determine required CFM usage, a person must add up all of the tools that will be used simultaneously. An air compressor is commonly rated by horsepower. The motor in thisPorter Cable compressor is 0.8 HP. This number reflects the power that is produced by the motor. Even though this number may appear low, this does not always reflect the strength of the unit. It is important to consider running horsepower and not peak horsepower. Peak power is the motor’s strength when surging at start-up. This can be deceiving, since it is usually much higher at that point than in reality. 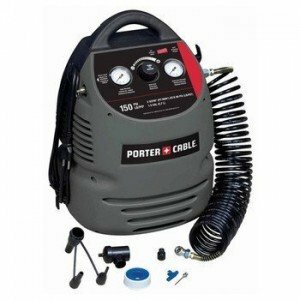 This Porter Cable air compressor is portable. This means that it is small and compact. The tank size is 1.5 gallons. This is one of the smallest tank sizes available. It simple to carry and will be able to power many different pneumatic tools. There is also an included water drain valve. The pump is a very important part. This is why it is essential to discuss what pump is used in this Porter Cable CMB15. This model runs on a single stage pump. There is no oil used in the pump design. A nonstick piston lubricates the cylinder. Since there is no oil in the machine, it helps to keep the unit lightweight. This air compressor runs on electricity. This makes it convenient, since it can be used anywhere that standard outlets are available. The benefits of using an electric air compressor is the fact that it can be used inside without fear of harmful fumes being emitted. This unit also has a low amp 120 V motor. There is no need to have an extension cord, and the cold weather will not affect start-up. It is important to discuss sound level in this review. This unit runs at 79 decibels. This is not much more than a household vacuum cleaner. This means that it will keep a work site free from loud noises. This air compressor is extremely lightweight. It weighs approximately 20 pounds. This means that one person will be able to easily move it from one location to another when it is needed. This porter cable CMB15 review should mention all of the features that it offers. The first thing to mention is its quick recovery time. The exterior design is fully enclosed. This provides protection from moving parts and high temperatures. It is a quiet machine, which supplies a calm working environment. The overall compact design is extremely durable. The rubber feet supply a sturdy and stable design. It can be carried anywhere and comes with a nice handle on the top of the unit. Uncovering an air compressor that comes with a number of accessories is convenient and will save time and money. This review must explain the accessory kit that is included at purchase. There is a 25 foot nylon coil hose, inflation needle, two tapered nozzles, 1/4 inch tire chuck, hose adapter, teflon tape, and a two piece high flow inflator/deflator. There are many positive things to mention in this review. To begin, the compact style makes this unit extremely portable. Despite the small size, it still provides a great deal of air pressure to power a number of pneumatic tools. The oil free pump ensures long life and low maintenance. It works quietly, so it will help a person with a variety of inflation jobs as well. Finally, the 2.0 SCRM@90 psi gives this compression fast recovery time. Very few people have complaints about this Porter Cable air compressor. Although the product works well, some users dislike the fact that it is necessary to change connectors when switching between tires and air tools. Also, the included nozzle only lets air go out when the valve is open. This Porter Cable review must include consumer ratings. This unit has received 4 1/2 out of 5 stars based on 32 reviews. It is extremely convenient and has been well received by consumers. This Porter Cable CMB air compressor is portable. This makes it small in size and small in price. It is one of the most affordable units on the market. Porter Cable CMB15 provides a great number of useful features to a user. It works efficiently to run pneumatic tools or to inflate items with air. The 1.5 gallon tank is totally enclosed, which will protect a user from burns or moving parts. When a person is in need of a machine that is versatile and effective, this portable air compressor is highly recommended as conclusion of this review.